If you have a fish emergency that requires the most professional, as well as, most prompt of all care.Please do contact us here at Michiana Fish Services and we will be there. This is because dedicated, and there for you emergency fish services is what we provide the most, for those who need it the most. We believe that emergency service should be there, whenever it is required, as we all can face emergencies ourselves when we least expect it. Michiana Fish Services is emergency services for your aquarium of the best kind. We offer a full line of fish services that are dedicated totally to the care and maintenance of your fish. This means full service aquarium cleaning services, emergency fish tank heater, and emergency fish tank water change quickly. Emergency fish services means what it means. We can handle any type of fish-aquarium emergency that may arise on you and that needs the utmost attention by professionals who can turn things around very fast. We perform total aquarium cleaning services and whatever else you may need indeed from a fish aspect. This is because, here at Michiana Fish Services, we make sure to cover the entire spectrum that is all about excellent fish maintenance on all fronts. This is because we know just how much you treasure your awesome and beautiful aquarium in every way. The very same can be said about the wonderful assortment of fish life that dwells in your tank, as well, in addition. Fish life of all kinds are very special. This is because they are very great and alluring creatures in their own right. We truly appreciate fish life of all kinds. Happy and health fish are what we do our very best to maintain for our customers. No one should have a dirty fish aquarium or have fish that are in dire need of some warmth. We can give these fish, all the vital things they need, in order to survive and live their lives to the fullest. Providing only the most excellent of all fish care is what Michiana Fish Services is all about and will continue to be about always. It doesn't matter if you are looking for a professional to install an aquarium for you or if you just want general fish cleaning and maintenance on your existing aquarium. We are there to care, every time, because this is what we do best from the rest. We totally dedicate ourselves and our business to the total maintenance and upkeep of fish tanks. The precious fish life that these aquariums contain are always number one with us, as well. They need a special care like no other and we provide them with this very special care. Michiana Fish Services is the one complete fish and aquarium care solution on all fronts. No one can do what we do and we are very proud of this fact. We have worked long and hard to establish this fact and our company. Call us, if you need us, and we will be there in a hurry to handle your aquarium and fish in a hurry. .
​Large tanks at home will require cleaning on occasion. Michiana Fish Services is a team eevoted to these projects. They have experience and dedication when it comes to their customer base. A diverse array of fish may be found in any given tank. Every component is likely diagrammed as part of the owner experience. Big tanks may hold dozens of gallons of water at any given moment. That presents a significant challenge for any true hobbyist. Owners can contact Michiana Fish Services when they need to schedule an appointment. They are surprisingly fast when it comes to responding to customer needs. Water in tanks will need to be changed according to needs. The team may look over the tank to decide whether there are leaks to be found. Standard repairs will keep tanks secure as they hold hefty supplies of water. Either fresh or salt water is important to fish species survival. Owners need to decide which variety suits their preferences during installation. An oxygen tube will keep fish breathing easy throughout the year. Michiana Fish services are available in the Northern Indiana area. A change of water and algae scrub down will keep the tanks looking their best. Fish species may be removed and kept in smaller containers until cleaning is finished. Michiana Fish Services is renowned for dedication to the cleaning process. All algal blooms should be scrubbed down to prevent problems from occurring. Several prominent fish services are now available for customers to track. The salinity of tank contents will be tested. Those tests will follow standards imposed for new aquarium styles. 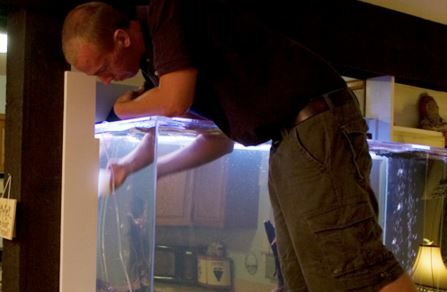 An installation process is required before the aquarium is put in place. Their heavy weight will keep them in place, but an inspection of contents is important. Potential issues include filter clogs and leakages along the glass sides. Gravel at the bottom will need to be vacuumed at will. Communication is important for customers with set ups around Elkhart, Indiana. Aquarium tank status is useful when it comes to filter material changes. A focus may be placed on emergency service options. Owners may wake to find a leak or other problems with their tank. The emergency fish tank water change is standard as part of a new arrangement. Elkhart, IN is a cold weather community, which means owners may be faced with chill issues. Aquarium cleaning services could include the installation of a heater. Michiana Fish services will work to offer guidance for the community at large. After the initial inspection, a service quote is offered for new customers. That gives them an idea of how to minimize cost burdens. A new package rate option is offered for leading consumers to follow. Water additives should be included in any standard cleaning package. Status updates for cleaning projects are offered for local customers. Inspecting current fish is an important part of Michiana Fish Services. They appreciate the opportunity to work with exotic freshwater and saltwater species.